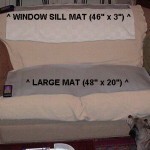 PRODUCT DESCRIPTION: Thin, soft, vinyl like feeling mats which have wires running through them. These wires are attached to a coupler which attaches to a battery pack. This pack has a low, medium and high setting. This setting is the amount of power which is sent to the wires which run throughout the mat. When powered on, this power will deliver an uncomfortable shock to pets like dogs or cats that walk over it. 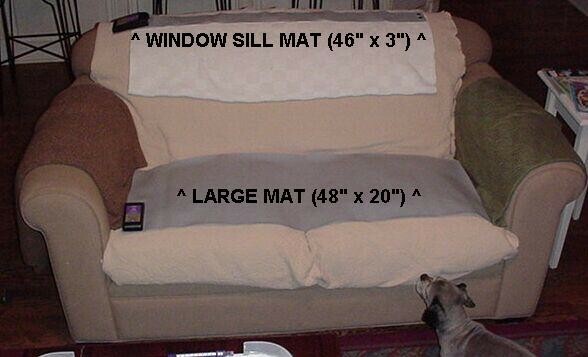 When installed, these mats are used to keep pets out of rooms, off counter tops or furniture or cars and window sills. Pets will learn to avoid areas where these mats are placed so they can effectively be "trained" not to go certain places. All mats are fully constructed and need nothing but batteries to operate. Simply install the batteries, lay out the mat and turn it on. Each battery pack requires one 9 volt battery. We sell many different sizes along with extensions. WHERE TO USE IT: In and around your home. At entrances of rooms, window sills, on the back of couches, on the couch itself, on the ground in front of the couch, on counter tops and basically anywhere you want to keep pets away. This is an excellent tool to set on any car you want to keep cats off so they don't scratch its finish. RATE OF APPLICATION: This will based on the size of where you are trying to keep the pet away. Simply install a mat which either covers the area you want to protect or one that is too big for the pet to cross so it won't enter designated areas of the home. $80.00 (742170) 30" x 16"
$40.00 (742172) 30" x 16" ext. $25.00 (742176) 46" x 3" ext. $100.00 (742178) 48" x 20"
$45.00 (742180) 48" x 20" ext.